In “Puppyslugs ‘R Us: Part 0“, I started out quite cheekily on a topic I hope to explore here in a bit more serious detail. 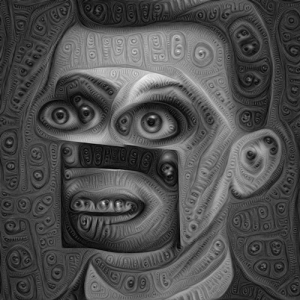 I’ll start with the recent Google “DeepDream” release and the so-called Puppyslug images you’ve perhaps encountered, explaining roughly what those are and how they come to be. I will connect that to AI and algorithms in general and then move specifically to how they already appear in your everyday mobile experience. From there we can paint a picture of what’s in store for us, and why I say the Puppyslugs are Us. I’ll conclude by setting up Part 2, and how all of this lands squarely in the lap of Design to deal with. In early June 2015, Google Researchers start showing off some algorithmically generated visuals which they originally label “Inceptionism“, after the DiCaprio movie of a few years ago, Inception. 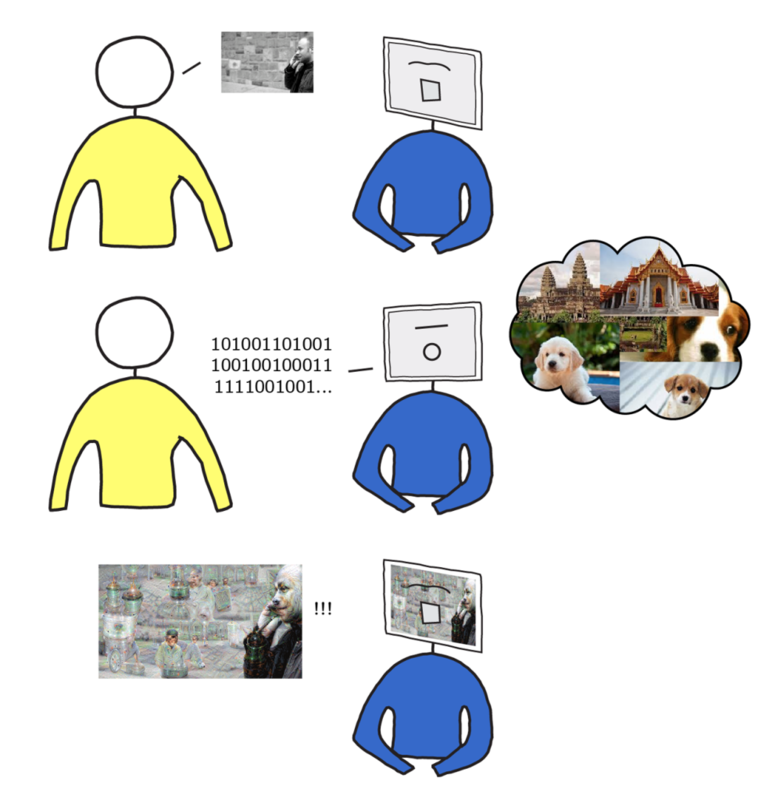 The algorithms in question use a technology known as Artificial Neural Networks (ANN). You can think of ANN as a sort of database, or “bunch of memories” the structure and mechanism of which is inspired by what we currently know of how our biological brains work. 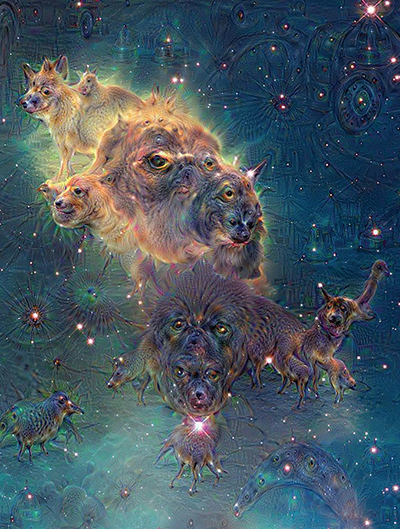 One of these was generated entirely out of many many pictures of puppies (and apparently some other animals). What came out of this is what we now call Puppyslugs. How these images are generated is important. 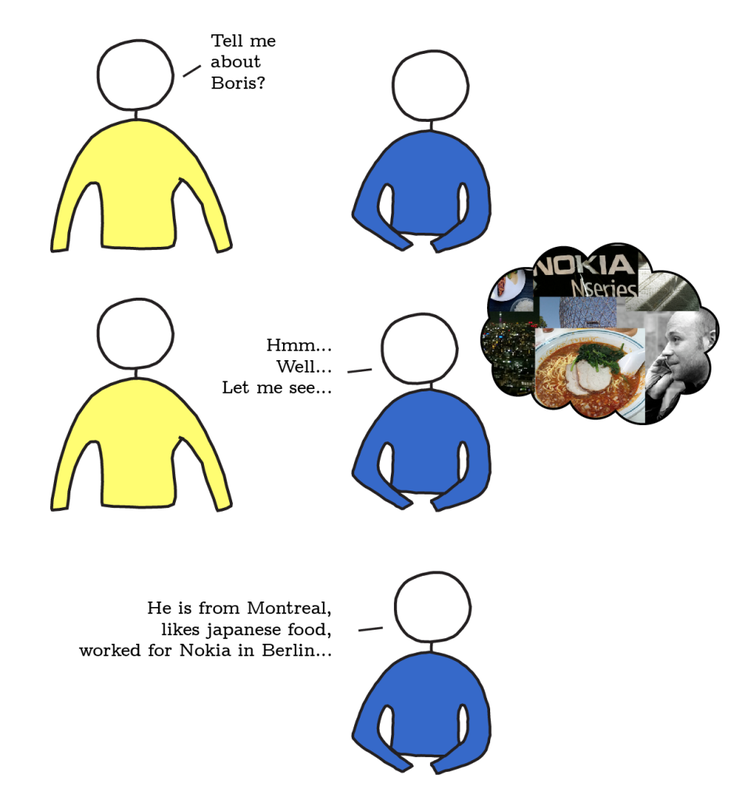 Not technically how, but conceptually how. If you ask a person a question, assuming they understood your question, they will answer you based on their knowledge. More specifically, they will formulate an answer to your question out of their Memory, the Situation the question was asked in, and what they believe may be Contextually Relevant in that Situation. Photo of the author, by Karl D.
More recently, we’ve gotten to know Apple’s Siri, Microsoft’s Cortana, Amazon’s Echo, and of course Google Now. There is a line of thought, Continuity of Consciousness in Identity, that holds that what makes you, you, aside the meat and bones, is your personality. What makes that personality, what makes you “an individual”, is the accumulation of experiences that have shaped you, all of them somehow stored in your <strong”>memory, and how they manifest themselves relevantly in a given situation. Guess who might be even better? An omniscient, omnipotent version of you! A being that knows everything you know… AND knows everything and can reach anything on the Internet. If someone has a record of everything you say and do on the Internet, they can create, using Artificial Neural Networks “AI” versions of you who, while keeping an eye on you, can also go and fetch information, products and services for you as you appear to need them, without your having to ask for them. While it most likely isn’t quite the case yet, very soon, very possibly, when you talk to Google Now, Cortana, Siri or others, it won’t be some random generalized AI you’ll be talking to. It’ll be yourself. I’ll let you chew on that for now. In the next Part, I’ll pick up the “this is design’s problem“ thread, as well as explore some of the obstacles still preventing this from happening. Don’t point that camera at me!